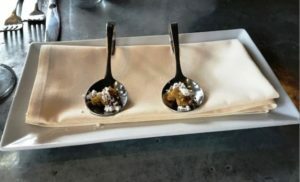 It has been nearly six (6) years since I first reviewed the Silverspoon Café… and, judging by a recent visit, not a great deal has changed in the interim. 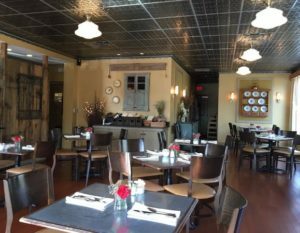 Tucked away behind Autograph Brasserie in Wayne’s Eagle Village Shops, the Silverspoon is a hidden gastronomic gem that continues to pack them in for brunch/lunch and dinner. The BYOB restaurant is a casually welcoming space. Large windows flood the restaurant with sunlight by day, while evenings are transformed into a relaxing candle-lit dining experience. Its simple, sophisticated ambiance offers patrons a tasteful alternative to the Disney World-esque décor of its highly publicized neighbor. The upside to this proximity, of course, is that one may enjoy a preprandial libation at the bustling Autograph bar before retiring to Silverspoon’s less ostentatiously frantic environs. Executive Chef Ron Silverberg tempts diners with an American menu of exciting complementary & contrasting seasonally changing ingredients… and his upbeat presentations are as pleasurable to the eye as they are to the palate. The moment his amuse-bouche hits the table (in… but of course… silver spoons), you know you’re in for a treat. The chef’s most recent gift…? Almond brittle dusted with a touch of curry powder embellished with a sprinkling of feta cheese. Unique and decidedly tasty. As you move on to the starters, interesting possibilities abound. If you’re a bivalve fan, the restaurant always features a daily selection of fresh Oysters. Then there’s the Farm House Board, an assortment of local cheeses & meats, the usual accompaniments and crostini; and a variation on the theme, the Pennsylvania Artisan Cheese Board. 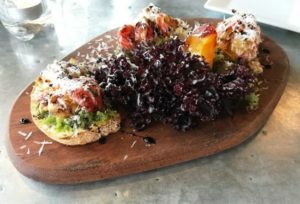 And speaking of crostini, the Daily Toast (pictured), grilled sourdough adorned with a savory seasonal topping, is always worth a look-see. Recently sampled, for example, was a mouth-watering combo of pesto, heirloom tomato, almonds, and pecorino cheese. The restaurant also boasts an outstanding selection of salads. The Heirloom Tomato Salad incorporates Persian cucumber, basil, burrata cheese, and soy-onion vinaigrette; while the presentation of Seasonal Greens combines confit artichokes, toasted hazelnuts and parmesan with a zippy champagne-mustard vinaigrette. When pressed, though, I always go for the Baby Arugula (pictured). 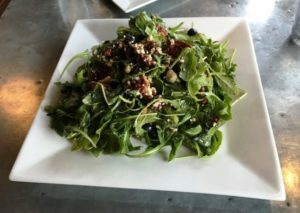 Loaded with spicy, peppery overtones, the Silverspoon’s rendition comes replete with New Jersey blueberries, pepper bacon, candied pecans, crumbles of blue cheese, and an assertive balsamic vinaigrette that teases the taste buds with its extraordinary sweet and sour interplays. As satisfying as the appetizers may be, it is the entrées that truly demonstrate Mr. Silverberg’s extraordinary culinary prowess. The current lineup of main courses is a compact affair, including such diverse items as Creekstone Farm Black Angus Shoulder Steak, Island-Rubbed Swordfish companioned by corn noodles, avocado, and mango-papaya chutney, and an intriguing Roasted Red Pepper Spaghetti spruced up with sweet peppers, guanciale (Italian cured pork cheeks), feta and mint. 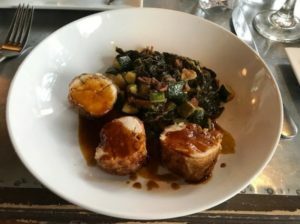 Normally, I would have gone straight for the swordfish; on this occasion, however, the Lancaster County Crispy Chicken Roulade piqued my interest. A roulade, which originates from the French word “rouler,” meaning to roll, generally refers to a dish of rolled meat or pastry (in this instance, chicken). The breast is pounded thin, rolled, secured with a toothpick or piece of string, browned to provide a crispy crust, and covered with stock and cooked. It is then sliced into rounds and served with a savory chicken jus. The meat is incomparably moist and succulent; and the accompanying mustard-braised collard greens dotted with diced summer squash add a tantalizing touch of heat to the proceedings. My dining partner opted for the Grilled Bone-In Prime Reserve Pork Chop. Prime reserve chops are cut from the center of the pork loin, maximizing flavor and tenderness. The “French-cut” – exposure of the rib bone from which the meat has been removed – adds to the elegance of the presentation. 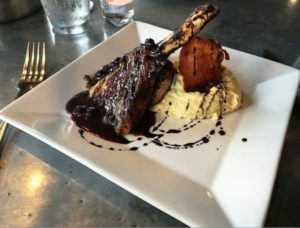 The pork itself is delightfully tender; and the balsamic sauce laced with blueberries and crispy prosciutto is absolutely delicious. The real killer here, though, is the polenta. It is the consistency of ultra-creamy mashed potatoes – but with infinitely more density – perfectly seasoned, and downright addictive… and it is also available as an absolute-must side dish. And speaking of sides… the Truffle Fries also fit into that not-to-be-missed category. They come topped with pecorino cheese and sizzled parsley in the company of a ramekin of garlic aioli for dipping. Even my dining companion, who is not particularly a French fry fan, found them irresistible. The secret, of course, is the texture. They hit the table firm and crispy and remain so throughout, never degenerating into that soggy never-never land. The sweet endings, all made in-house, are certainly worth saving room for. The Espresso Sugar Dusted Doughnuts are a house favorite. Made from the restaurant’s own Philadelphia cream cheese recipe, they are fried to order and garnished with chocolate and vanilla sauces. But even better, in my opinion, is the “Bananas Foster” (pictured), the Silverspoon’s unique take on the classic incendiary dessert. 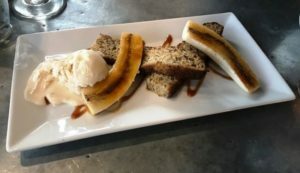 It consists of banana bread, brûléed banana, and brandy & brown sugar ice cream. Brûléed banana is nothing more than slices of banana with a caramelized crème brûlée-style crust. It involves sprinkling the banana slices with granulated sugar and the (extremely cautious) use of a kitchen blowtorch to bring out the desired caramelization. Here it is carried off with understated style and panache. The Silverspoon Café quietly continues its role as one of Wayne’s most popular restaurants. The quality and presentation of the cuisine, to my way of thinking, have never been in question. Main line foodies know a good thing when they taste it; and judging by the ebullient crowds, they obviously taste it here. But there are other issues that seem to arise from time to time. When the restaurant is full and overflowing, for example, the noise level can be formidable. In my opinion, however, this only adds to the cheerful bistro-like atmosphere. No, for me, the major problem has always been the sometimes “iffy” service. 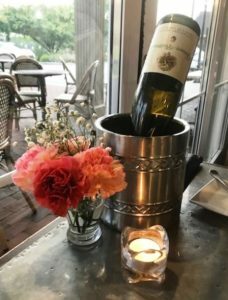 On one occasion, our server was so neglectful that my dining partner and I could very easily have walked out the door, completely unnoticed, without paying the check. Fortunately, during my most recent visit, our server was not only knowledgeable but also extremely efficient. Hopefully this bodes well for returning and future patrons.